Kolt’s family is big. And it’s not the most self-explanatory. It took me a few months just to get all the names down. And now, through the magic of their all-embracing love, they’re my family too, and as I learn the rhythm of their whirlwind dance I love it more and more. Statistically speaking, it’s pretty unfathomable how awesome every single one of them is. In May, we celebrated the official addition of another member when Kolt’s brother, Chase, married his highschool sweetheart and badass business partner, Paige. Their wedding was actually the day we planned around for starting this adventure and, by the time we were dancing at the Colorado reception, we had quit our jobs, sold most of our stuff, and bought our one-way tickets. Since they run a growing new gym in the Denver area, Chase and Paige waited a few months between their wedding and honeymoon. This worked out perfectly for us to line-up our schedules for a glorious rendezvous in Prague. Fresh off our time with friends in Germany, we got to soak up another 4 days of laughter and love with family. We split a funky AirBnb in a great little neighborhood where beer sells for just over 30 cents and a great meal is only a quick walk away. Aside from a lot of catching up and a little bit of day-drinking, we were also able to explore the charming streets of this bucket-list city. I’m all about the little details, so I couldn’t get enough of the butter-cream yellows, muted corals, or soft mint green painted buildings. Bright flower boxes underscored the windows and quaint balconies were abundant. The winding streets of the Old Town neighborhood are full of hidden treasures for an avid window shopper. ‍Seriously, these homes are so cute! The four of us climbed to the top of a park overlooking the low, clay-roofed cityscape. We smiled at the street artists and vendors along the Charles Bridge and exchanged confused glances about the peculiarly violent sculptures within the baroque St. Nicholas Church. 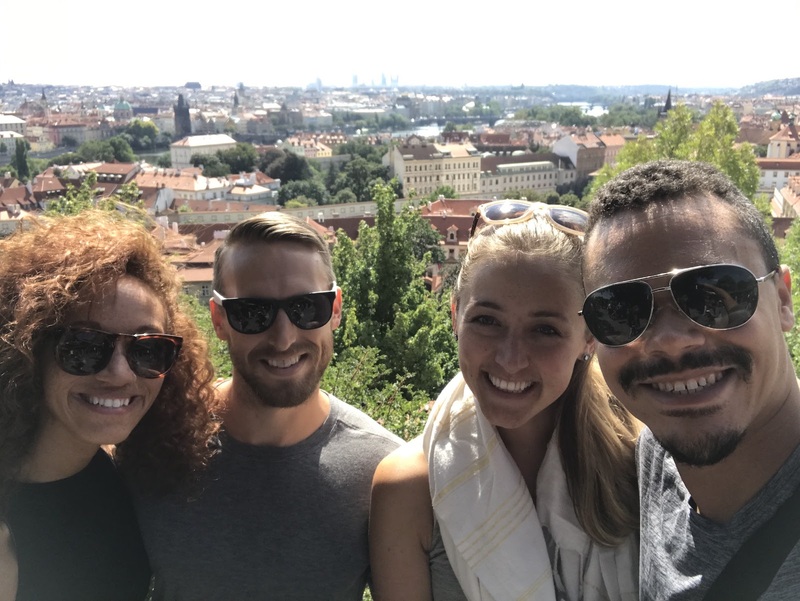 We spent a full day exploring Prague Castle and all its nooks and crannies, including a stunning and somewhat less violent cathedral at its center. Wandering down a side street, we stumbled on the Lennon wall, a vibrantly graffitied tribute to art and ideals of peace and love. I shamelessly took advantage of my new sister’s tremendous skill as a yoga instructor and got a private lesson in our living room that loosened up my travel-weary spine. The four of us spent hours talking into the night and I know Kolt and I had a blast just being together with family. Our last morning was spent on an epic trek to find some fantastic gelato before hugging goodbye in Wencelas square and heading to our next destinations. We boarded a train bound for Vienna with smiles on our faces and warmth that only family can bring.